You might be shopping around for a ping pong table and could have seen the JOOLA Inside 15mm Table Tennis table as one of the options. 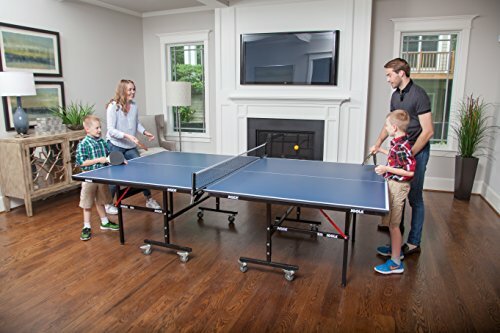 An excellent alternative for an official-sized ping pong table, it has several features that casual players would enjoy, packaged at a favorable price point. In this JOOLA ping pong table review, we will look at what makes the product great, as well as the not so great features it possibly has. After weighing in these points, we will then wrap up the review with a recommendation if you should get this or not. Before going on our product review, let’s get to know the company behind the Inside 15 ping pong table. Based in Germany, JOOLA started their production of table tennis tables in 1952. Fast forward to 1992, their line of ping pong tables was chosen to be the official tables for the Atlanta Olympics, which continued to the next Olympic Games. The company was then able to enter the US table tennis scene starting with the JOOLA North American Tour in 2000. This was then followed by the company opening stores in North America by 2006, and partnering with the nation's governing body for the sport of USA Table Tennis (USATT) on 2012. The partnership with USATT makes JOOLA an official sponsor of table tennis in the USA. Based on the product details, we can see several features, as well as some missing aspects of the ping pong table. 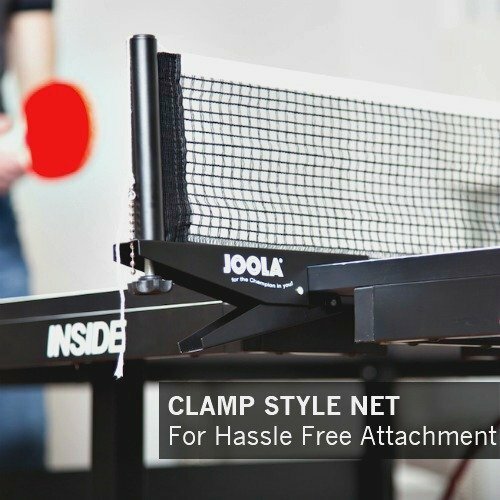 In this section of the JOOLA ping pong table review, we will go through the major features, learning more about them. This ping pong table is made with medium-density fiberboard and has a multi-layer painted surface. It measures roughly the same size as an official game table, save for the table’s thickness of 5/8 in (or 15 mm). While it may measure lower than the 1-inch requirement for sanctioned games, it can still do the job for casual and recreational playing. Additionally, the manufacturer claims that the table offers exceptional bounce and durability to provide satisfying games every time. As for the linings, these are made with silk-screened white stripping that are painted on the table directly and then cured with ultraviolet light. This assures that not only do the lines stay on the table for a long time, but also keeps the surface smooth and consistent. Unlike other ping pong tables in the market, the JOOLA Inside 15 does come with a 72-inch tournament grade net. Made from premium quality materials, the net is promised to be durable and has tension adjustments that help keep the net in place. Installation is also a breeze, as the net include clamps that attach to the sides of the table. Also, the product has a strong and sturdy base and legs. 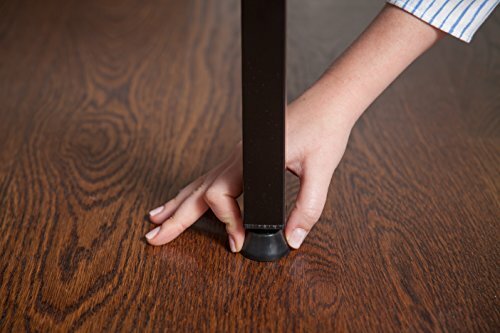 Made from 1.5-inch steel, each table leg has leg levelers attached to aid in securing a level and stable playing surface. It half of the table also has four wheeled legs to make moving the ping pong table easier. Each caster wheel has a locking device, securing its position whether in storage or in play. Speaking of storage, the undercarriage also features a safety latch system to secure the position of the table in the room. Made with a spring-loaded design, these latches will make sure the table does not accidentally unfold. An interesting design choice of this table is its independent halves. This means each half of the table can be used and folded by itself, having multi-tables if desired. This feature leads up to the table’s famous Playback Mode, where you can still play ping pong even if you are by yourself. Just fold down one part of the table while keeping the other folded, and you can bounce the ball off the folded portion of the table. This is also an excellent way to practice before a friendly match. As seen on the product details, the JOOLA Inside 15 Table Tennis table can be assembled for a play in less than 30 minutes. Upon delivery, it is also ready to play, with minimal setup required. Additionally, it comes with an easy to understand instruction manual to help you set the table. Now that we have checked the significant features, this JOOLA ping pong table review will now move to the good, and the not so good points of the product. Durable and lightweight design. The table weighs around 140 lbs., making it easy to transport and move around. Easy to assemble. It comes mostly collected upon delivery, and only needs less than 30 minutes to begin playing. Very affordable price point. Compared to other ping pong tables in the market, the Inside 15 costs less while providing most of what casual players need. Additional security. In storage or folded mode, it has a spring-loaded security latch system that locks the table in its position and avoids unexpected unfolding. While playing, each of the eight caster wheels has locks that prevent it from moving around. Thinner table. The Inside 15 only offers a 5/8 inch thick table, which can affect the bounce of the ball and is far from the 1-inch thickness that is asked for sanctioned games. No paddles and balls included. This means you will need to purchase balls and paddles separately. Possible table warping. As the table is not thick enough, it has the tendency to warp in warm or humid temperature. So we now know everything that we can about the product, the good and the bad included. It's time to ask the most critical question in this JOOLA ping pong table review: should we get the JOOLA Inside 15? The answer to this will depend on the type of player you are. For serious ping pong players, it would be best to look elsewhere than getting this table. Its thinner table can be a detriment to players who want to practice, as it delivers a different bounce to the ball. However, for casual players, this is a great option to play recreational ping pong. It is affordable, and it has most of what casual players need to play. Purchasing paddles and balls separately would be required though, as it does not come with those. There you have it, a JOOLA ping pong table review. We hope that this could help you make the purchase. Remember, enjoy playing ping pong!